Shape Up! 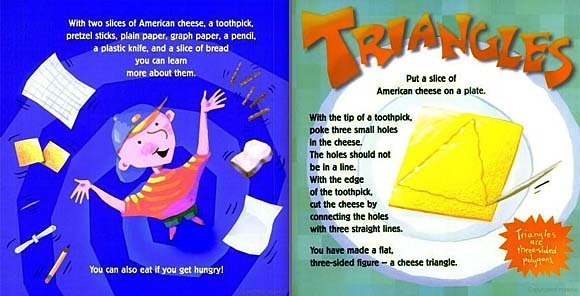 provides a "bouncy, hands-on introduction" (SLJ) to basic geometry concepts, teaching geometry concepts like triangles, angles, and polygons--all via fun, interactive exercises that incorporate small food items like cheese, pretzels, pieces of bread, etc. 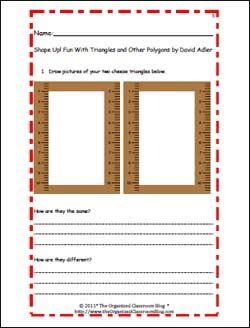 What a fun, memorable way to learn scalene and equilateral triangles, the different types of polygons, all the way up to dodecagons (12 sided) and more. We know some teachers do not like using food for educational purposes, but the quantities involved are small and the food items are not as unhealthy as the usual 'activity with food' choices (generally candy.) Some of the most effective exercises involve a piece of paper, not food. 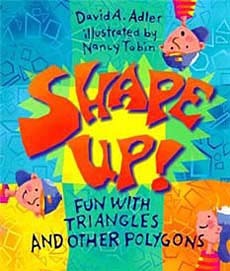 Overall, we highly recommend this fun title for teaching geometry lessons! It's a Parents' Choice Gold Award Winner! Parent's Choice called it "beginning Geometry made easy. A winner." Below are sample pages from inside Shape Up! This illustrations on the right shows how three pretzel sticks can be used to teach students about equilateral triangles. Further pages show how to change these pretzel sticks to make an isosceles triangle, then to learn what a vertex is. 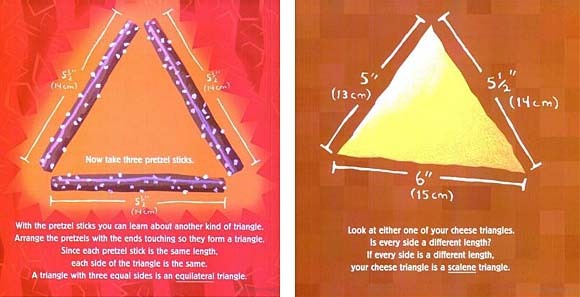 This is one example of how food items are used to teach geometry in this book. If you would like to use this book when teaching geometry lessons, Charity Preston of the Organized Classroom blog has created a detailed guide on how to use this book in the classroom, including a number of handouts (like the one shown at right). To download Charity's PDF guide for this book, click here.